It all began with a leftover ham bone and a hungry husband. At least that’s how my mom tells it. My dad suggested cooking the ham bone with some beans, and my mom built this dish around it. The rest, I guess, is history. This week my friends in the #SundaySupper group are hosting a virtual cookout to celebrate Labor Day. What better dish to bring than my Mom’s Savory Pork ‘n’ Beans? For many, the mention of pork and beans conjures up images of a sweet and tangy pot of beans, maybe even with bits of hot dog floating about, but we’re not going there today. This bean dish is savory and satisfying–hardy cowboy fare. The history is unclear, but it’s well settled that by the mid-19th century variations of pork and beans were popping up in American kitchens. While Van Camp sold its salt pork and beans with stewed tomatoes to the US Army during the Civil War, it wasn’t until Heinz started canning them in the 1880s that they really took off. It’s unclear where all that sugar came in, but we’ll have none of that here. My mom’s version is smoky, with the flavors of the tomatoes, chili powder, and white wine melding together in complete harmony. In our family, that’s how it’s done. 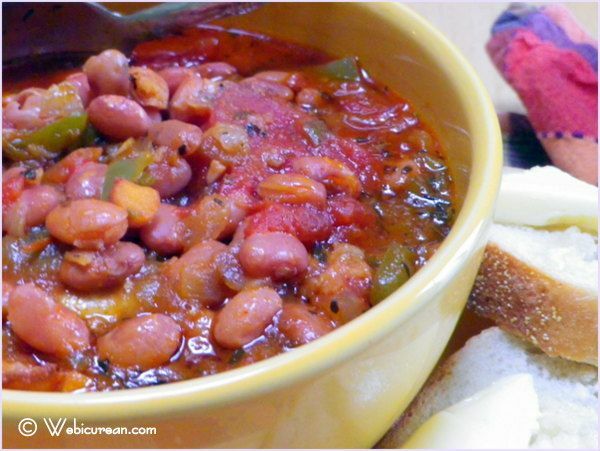 In fact, similar bean dishes have been part of our family barbeques since the beginning of time. One of the things I miss most since the family home was sold are the gatherings we had there. The house had been in our family for nearly a century, and it was the one place we all returned, like homing pigeons, whether there was a party going on or just to drop in and say hello. 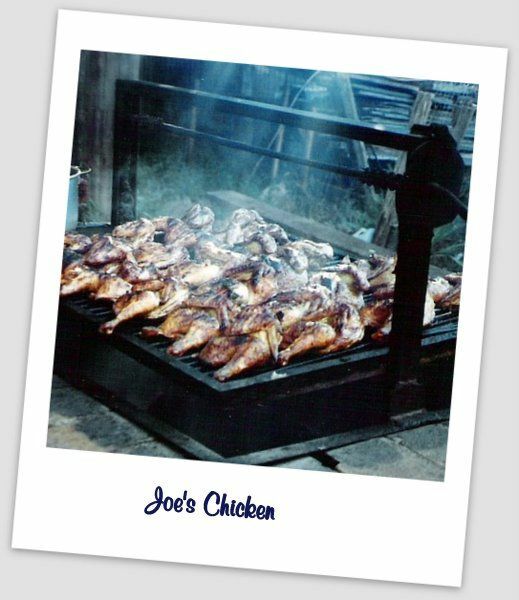 Yep, all those chickens are for one family, grilled to perfection with our family’s secret BBQ sauce (which, by the way, is not sweet either). Just call us the savories. Now, on to the beans. 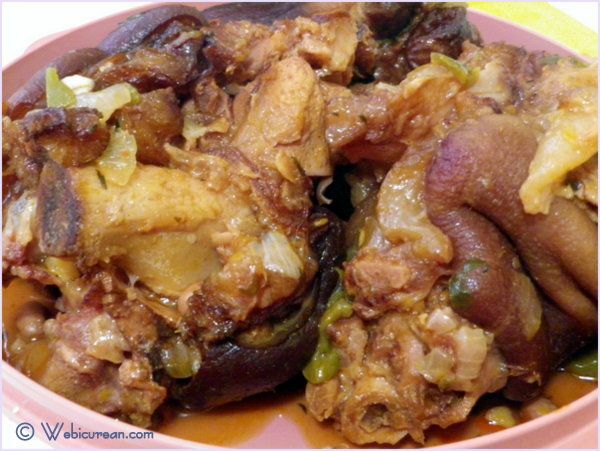 While I’m using smoked ham hocks here today, keep in mind this is a great dish to make with a leftover ham bone, and in fact, that’s how I prefer it. You’ll get more meat that way too. Also, this can be prepared on the stove top; however, my preference is using a crock pot–it’s less work, and it’ll be contained in its own warming dish at your shindig! By the way, this dish is super easy to make. First, place your beans (which have been soaked over night) in the slow cooker along with the ham hocks, and add enough water to just cover the beans. In my pot, this was about three cups. Cover and cook on “high” for one hour. Next, gather and prep the remaining ingredients. Yep, that’s my messy writing in my personal cookbook. 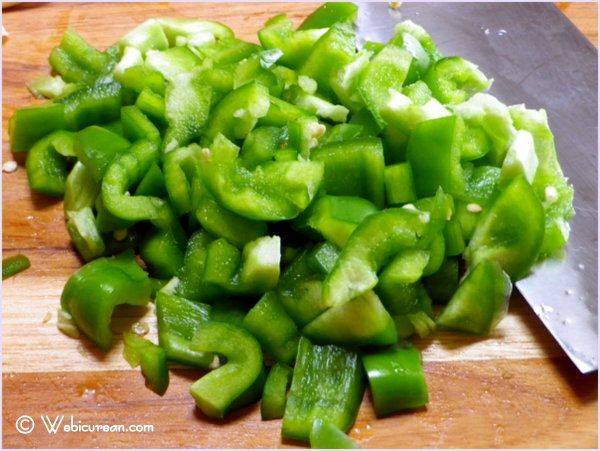 Give the bell pepper, onion and garlic a good chop. 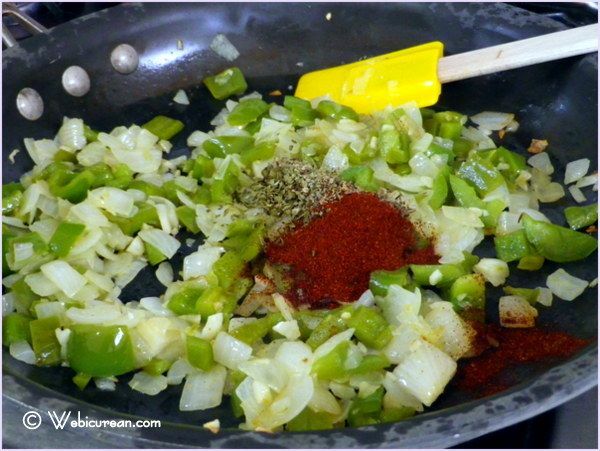 Add olive oil to your skillet, then sautÃ© the onion, garlic and bell pepper until the onion is translucent. Next add the chili powder and herbs, and toss until heated through. Has it been an hour since you put the beans on? If so, add the sautÃ©ed veggie mixture to the crock pot. Now add in the remaining ingredients–tomato sauce, stewed tomatoes, and white wine. Give a good stir, then cover, reduce heat to “low” and cook for an additional six hours or until the meat is falling off the bone. Remove the ham hocks (or bone) from the pot. I know, this looks pretty gross! Remove any meat from the bone, chop it up, and return to the pot. Serve piping hot with a crusty loaf of French bread. Enjoy! 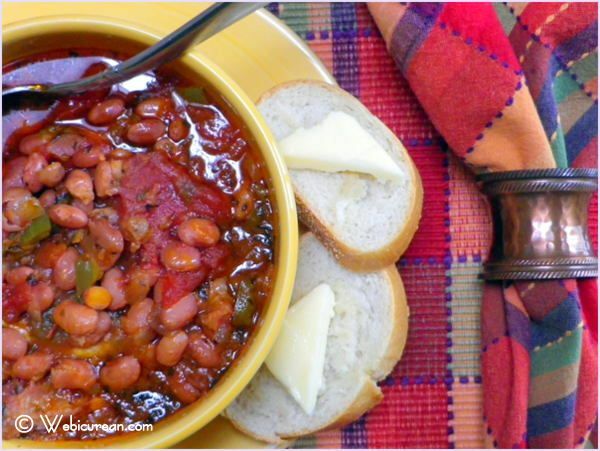 These savory pork and beans are a crowd pleaser and super easy to prepare. 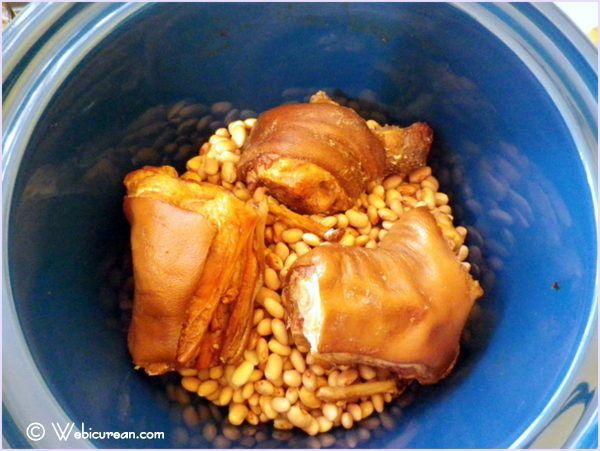 Place ham bone in large crock pot along with beans. Fill with water until beans are just covered. Cover, set on "high" and cook one hour. 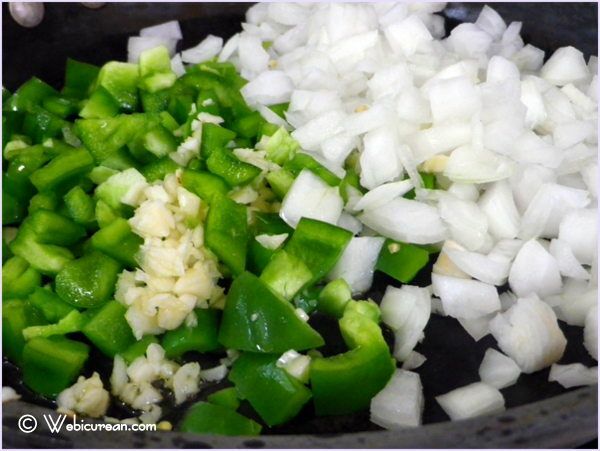 Meanwhile, in a frying pan, sautÃ© onion, garlic, and bell pepper in olive oil until onion is translucent. Add herbs, chili powder and pepper just to heat through. To the crock pot, add onion mixture along with the remaining ingredients. Stir, cover and reduce to "low" cooking another 6 hours or until the meat is falling off the bone. Join the #SundaySupper crew as we share our favorite cookout recipes . Â We hope to inspire you with these fabulous recipes from our talented contributors. Â We will be sharing them all day long and would love for you to share your favorite cookout recipes during our #SundaySupper live chat at 7pm ET. Please be sure you join us on Twitter throughout the day during #SundaySupper. Weâ€™ll be meeting up at 7:00 p.m. EST for our weekly #SundaySupper Â live chat where weâ€™ll talk about our favorite cookout recipes! All you have to do is follow theÂ #SundaySupper hashtag, or you can follow us through TweetChat! Weâ€™d also love to feature your Cookout recipes on ourÂ #SundaySupper Pinterest boardÂ and share them with all of our followers! Join Webicurean next week for some good old-fashioned potato salad, with a twist! Your pork and beans look incredible! I cant wait to try this fabulous recipe. Oh wow! Now that is true pork and beans! 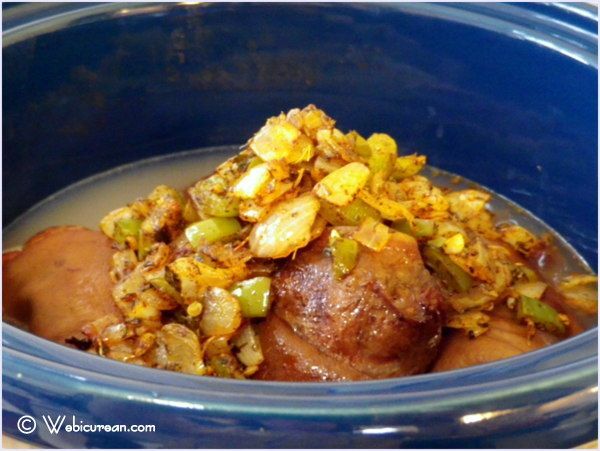 I blove using ham hocks with beans for soups and stews too! I’ll bet this has great flavor! Beans just aren’t right if they’re not made with a ham bone! YUM! Love that it’s a crockpot recipe! Any beans cooked with a ham bone or ham hocks is a winner to me. I love the spices and everything else in this dish. I love the addition of the wine in this recipe! I could just eat the beans with the bread! Love, love the family food history for this recipe! Looks fabulous too! This is a case when the prep is definitely worth it in the end–looks great! It really isn’t all that bad–just a lot of waiting! I am not a big pork and bean fan but my daughter makes up for that. They are one of her favorite things!! That is a SERIOUS barbecue – I LOVE it! And these beans sound amazing…I would probably hide in the corner with the pan and a spoon. And a beer. ;P YUM! I know, right? When my aunt sold the house, the new owners took out that BBQ as well as the expansive herb garden… all I could say was WTH?! I’ll take a serving of beans and that bread with that lovely butter on it for dipping! Perfect for a holiday cookout! I love recipes with a story. They sounds so good! yummy! 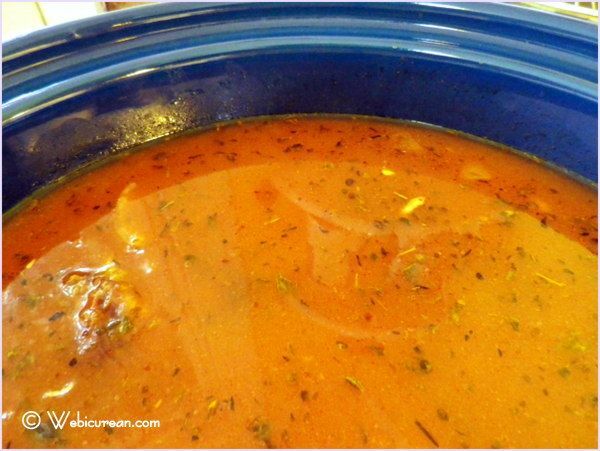 What a serious recipe – and I love that you can use the crock pot! I love that you shared a family recipe during #SundaySupper. I can’t wait to try this delicious recipe. Looks yummy I will have to try. That looks savory indeed ! Yumm ! Great pics 🙂 I want to steal that napkin and placemat !! So pretty ! 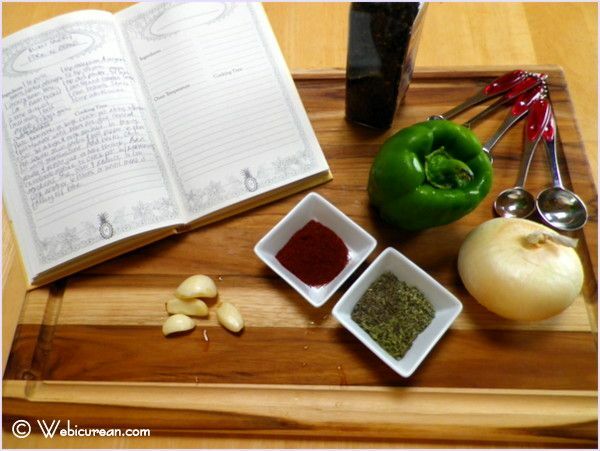 LOVE the family history behind this recipe! Beans with pork sounds wonderful! I so want to steal that BBQ Pit! I love that you prefer your beans without the sugar. For years I thought I hated baked beans because they were way too sweet. Then my husband introduced me to English baked beans, they don’t use sugar here, and I realize that I love it. I must try your recipe next time. I love me a GREAT slow cooker recipe! I’m a savory kind of gal so the flavors in the dish sound perfect. Pork and beans are one of my favorite dishes. I could live off them, and I love dipping my cornbread in them. These look delicious. I don’t want to steal the bbq pit I just want to be invited to ALL your family functions. Ham on the bone sounds amazing. You took the Pork to a higher level my friend. That’s my doing the om my yummyness dance, going to have to try this one!! Picnic Friendly Grilled Vegetable Salad #SundaySupper | Mama.Mommy.Mom. The Bay Alarm Medical Holiday Recipe eBook is Here!